Looking for an impressive e-mail backup solution? Backup E-mail uses an easy wizard interface to backup everything from Microsoft Outlook, Microsoft Outlook Express and Windows Mail. All it takes is a single click and you're done! It'll even backup your Internet Explorer Favorites! Unlock the POWER of Backup-Email for just $24.95. Want to Learn More About Backup E-mail First? Read our feature list, browse screenshots, or dive into our FAQ. The full version of Backup E-mail is delivered electronically, with a download link sent immediately via e-mail. The full version is unlimited and allows the recovery of files. It works with Windows 98/ME/NT/2000/XP. Installation requires an Internet connection. 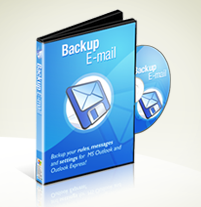 Want to purchase your copy of Backup E-mail via PayPal? That's no problem. Simply CLICK HERE to place your order. You'll receive your download links via e-mail immediately after purchasing. Order on CD-ROM for an extra $15! Want to purchase a version of Backup E-mail on CD-ROM? This costs an extra $15, delivered in a hi-tech ejector CD case. Plus we even include FREE international shipping. You will also receive an immediate download link via e-mail. To purchase Backup E-mail by download and on CD for $39.95, please CLICK HERE. If you're experiencing difficulties with our program or site, simply contact us via our dedicated support site, found on the chat widget below. We guarantee to answer all of your questions quickly and efficiently, with technicians regularly available to assist you. Home | FAQ | Download | Buy NOW!